Note: In recent weeks the country of Venezuela has implemented everything from price controls to rationing in an effort to control the hyperinflation that has gripped the nation. All attempts at controlling demand and ‘hoarding’ have thus far failed, prompting government officials to issue directives requiring biometric verification for the purchase of foodstuffs. What’s happening in Venezuela is a clear example of how government first causes the problem, often leading to panic, and then points the blame at everyone but themselves. Officials claim that unscrupulous merchants (who have been forced to sell goods at prices lower than they have acquired them) and the hoarding of food by individuals is to blame for the shortages. The solution, of course, is more government, and in this case that means registration of fingerprints and other personal data in exchange for permission to purchase food. Be assured that the same plans are in place right here in the USA. In fact, we already have an electronic mechanism of exchange in the form of Electronic Benefit Transfer (EBT) cards. Should the worst happen and the US dollar crashes at some point in the future, those who failed to prepare (or, hoard as the government would suggest) are destined to forced registrations at their local post office or other government entity. 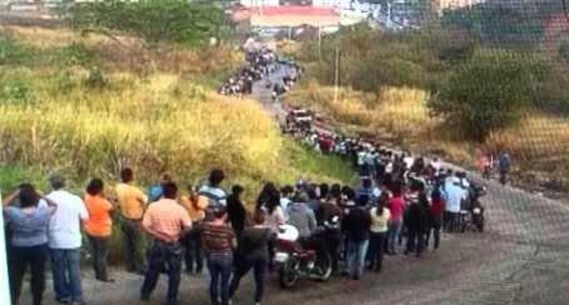 Daisy Luther of The Organic Prepper explains what’s happening right now in Venezuela, how a similar situation could unfold in the USA, and what you can do to prepare in advance. For those looking to implement a frugal and highly effective strategy in advance of food shortages or currency crisis we suggest taking a look at Daisy’s book The Pantry Primer: How to Build a One Year Food Supply in Three Months. Also check out another option from us here: A Year of Supplemental Food Storage for $300 for a family of FOUR !